Buying local gets the artisan touch at Trolley Square Mall. The 7th Annual Holiday Market will take place December 14th and 21st at Trolley Square Mall in Salt Lake City on the upper level near Desert Edge Brewery and The Old Spaghetti Factory. Local artisans and crafters will offer a wonderful assortment of locally produced holiday gifts to shoppers. 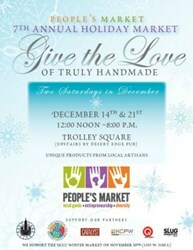 Buying local gets an incredible artisan touch at Trolley Square Mall when it hosts the Annual People's Holiday Market. The 7th Annual Holiday Market will take place December 14th and 21st at Trolley Square Mall in Salt Lake City on the upper level near Desert Edge Brewery and The Old Spaghetti Factory. Hours are 12 noon to 8 p.m. both days. Local artisans and crafters will offer a wonderful assortment of locally produced holiday gifts to shoppers. These hand-crafted gifts are available at excellent prices, and you will find something for almost everyone on your list. Many of the vendors accept credit and debit cards to make holiday shopping easier. The public is invited to shop the beautiful selection at the Holiday Market, and enjoy the holiday atmosphere of both the market and the Trolley Square Mall. Shoppers can enjoy beautiful music, free candy canes for the children, and general holiday cheer while they browse the wide selection of artisan goods, many of them locally produced and all sold by local companies. The annual event has grown in popularity, and vendor slots sell out early every year. Over 50 vendors will offer an eclectic mix of goods at this year’s Holiday Market. The Holiday Market is committed to the ‘Buy Local’ message to strengthen the local economy and keep more holiday purchase dollars here. The Salt Lake City People’s Market is the original Sunday Farmers’ Market and the only one serving the West Side community. A non-profit, 501-C3 organization, the People’s Market is dedicated to local farmers, artisans, crafters, and food suppliers. All market vendors are encouraged to self-produce, but local entrepreneurs who import artisan goods are also welcome. A Local First Utah member, the group’s mission is focused on community and the buy-local movement. Vendor participation offers growers, producers, and local artisans and crafters a place to develop a business or additional market outlets. A Young Entrepreneur’s program encourages aspiring young people to participate and learn some basics of running a business. Vendor education is also offered each season. Diversity is celebrated by the organizers of the People’s Market, and reflects the dynamic mix of cultures in Utah. There are several Special Event Markets each season and the entire list is posted on the organization’s popular Facebook page.